He's got 7 out of 8 calls right. What's his view now? Pratik Vasa stuck his neck out in Dec 2012, calling for a sharp depreciation in the rupee, at a time when there was no whiff of the currency turmoil we are now witnessing. This was one of 8 calls he made in Dec 12, of which 7 seem to be coming good. In this piece, Pratik provides his updated views on the Sensex, on the rupee and on key sectoral indicies. His prognosis : rupee will continue to fall, IT will be the big winner, PSUs and capital goods will continue to erode further and the Sensex is likely to be in a bearish mode till Jan-March 2014. 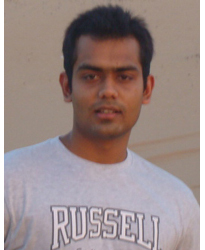 On 5th Dec 2012, Pratik, a young Mumbai based technical analyst, wrote an article on our site, painting a grim picture for the Sensex and the rupee for 2013, but a bullish picture for some key sectors, where he saw plenty of money to be made in 2013 (Click Here to see the 5 Dec 12 article). Seven months into 2013, 7 out of his 8 calls appear to be coming good. Not a bad strike rate, even for a veteran ! The most striking call was his call on the rupee - back in Dec 2012, there was no whiff of any currency pressure and the call of a sharp depreciation from 54 levels to 65 levels seemed a very steep one - at least at that time. The other noteworthy call was his bullishness on FMCG and Pharma - which were already looking expensive to many fundamental analysts back in Dec 12. His bullishness on IT sector back in Dec 12 stood out in stark contrast to the general caution on this sector in the market, at that time. Sensex has not breached the 2008 highs. The rally from 2003 to 2008 was a bull run for the markets but since 2008 we have seen that the Sensex is in a range bound with 21109 on the higher end and 15000 on the lower end. 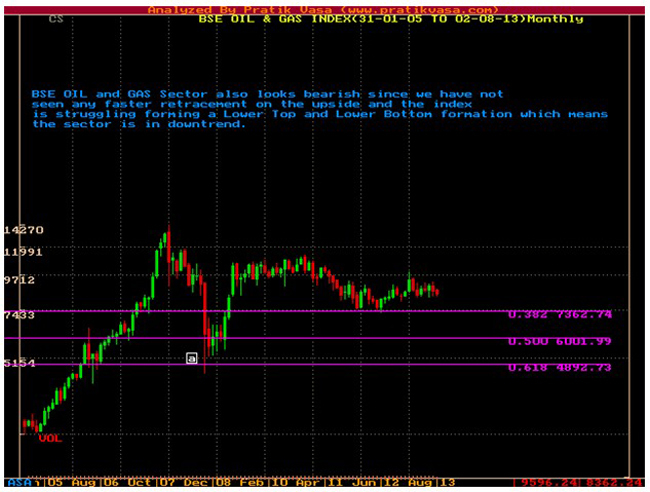 In a range bound market the lower range is a buying area and the higher range is the sell area. 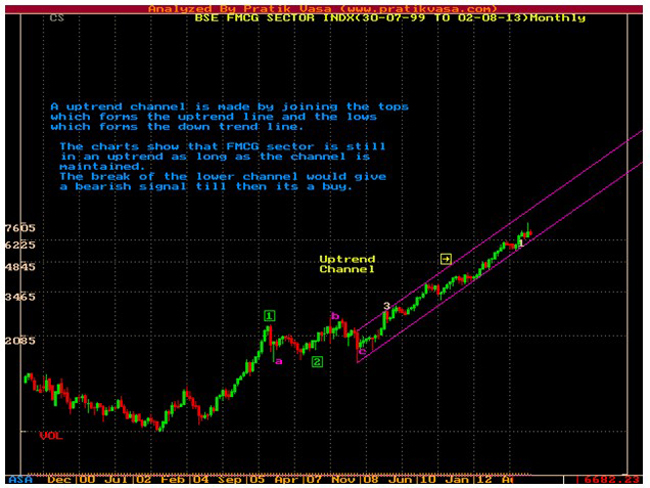 The BSE Sensex is assumed to form a triangle (5 legged pattern) or a diametric (7 legged pattern). We consider the pattern from 2008 where the fall from 21000 (January 2008) to 8000 (March 2009) levels is a downward leg (A wave). 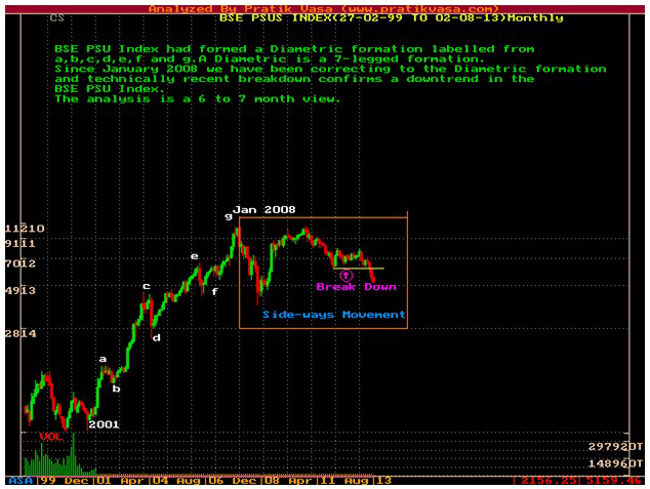 Rally from 8000 levels (March 2009) to 21109 (November 2010) was an upward leg (B wave). After this up-move we saw a downward leg from 21109 (November 2010) to 15100 levels (December 2011). This downward leg was the C wave. 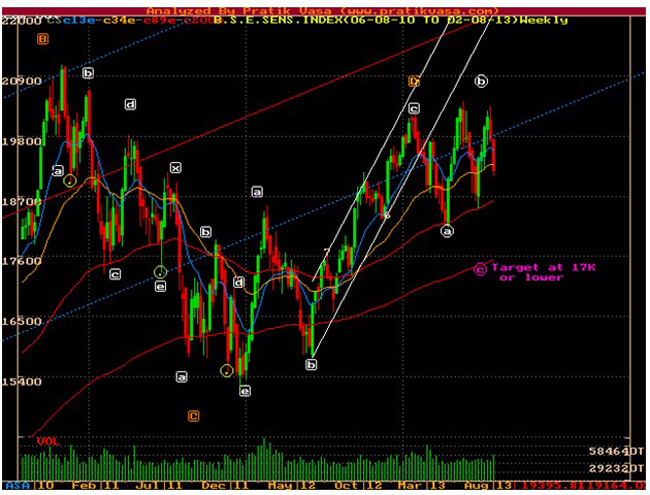 The D-wave had opened upwards and continued from 15100 to 20300 levels and did not breach 21000 levels. The fall from January 2013 has broken the white lower channel line which means that we have started the downward E leg since Jan 2013 and we are still in the downtrend which is likely to continue for next 6 to 7 months i.e Jan- March 2014. Sensex is heading down towards 17,000, possibly lower. The Range-bound market scenario has seen a huge divergence in sectors and Dollar.While the Metal Index, Power Index , Capital Good, Oil and Gas, PSU Index have under-performed the only sectors which are holding the market levels are the FMCG, IT and the Healthcare Sector. The BSE Oil and Gas Sector has been in a lower top and lower bottom formation which looks that there is still no good investment options in this sector. 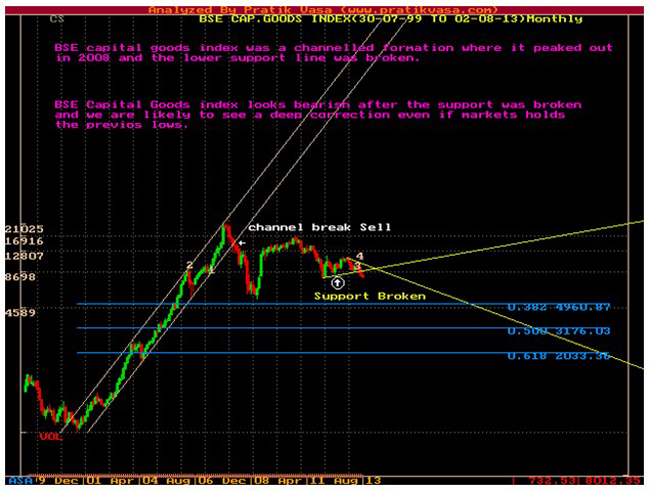 BSE Capital Goods Index has recently broken the support and is a clear sell. Technically if stocks are available at lesser price they may stillgo lower. At this point investments in this sector should be avoided. In my last article I had mentioned that BSE FMCG sector is in uptrend I would still hold to my view since we have seen new tops and the falls are not sharp. 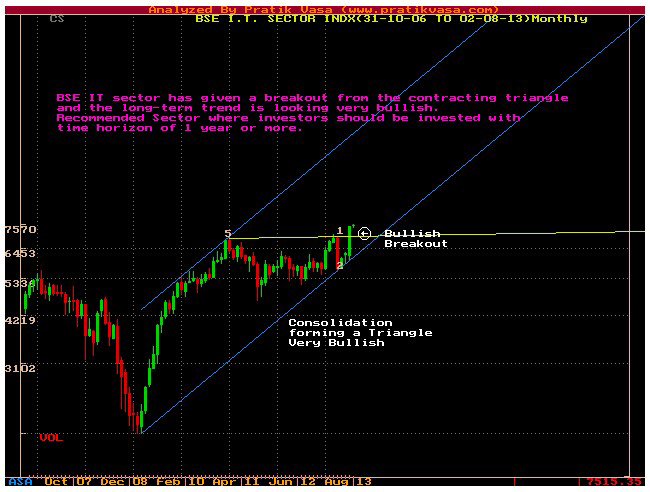 A trend is likely to continue then reverse suddenly. The change in the view would be after the lower channel line is broken. 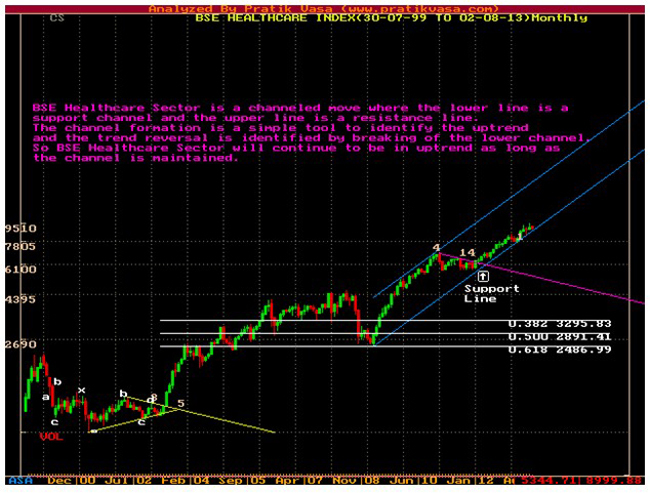 Similar to the BSE FMCG sector the Healthcare sector has been forming a channeled move as shown by the blue colour channel. The sector is still looking bullish and most of the stocks are at new highs. But though the sector looks bullish Ranbaxy is a stock to stay away. The BSE IT sector has given a bullish breakout and is likely to still go higher. One should consider this sector as an investment opportunity and make money with the falling rupee. In the Link above on 22/06/2013 chart was posted on my Facebook page where a bearish view on the PSU Sector was confirmed after which the PSU sector has seen a lot of selling and few stocks like PFC have lost around 50% from the top value in 3 months. The View continues to remain bearish in this sector and we may see much lower levels going ahead. 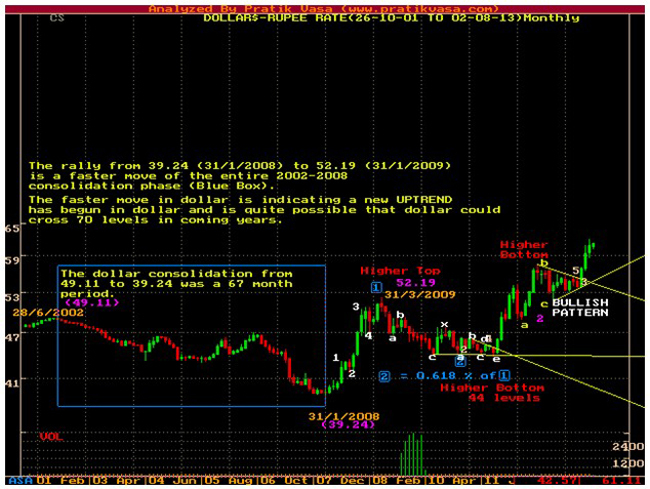 The Dollar V/s INR was in an uptrend since 2008 and since then we have seen a Higher top and Higher Bottom formation. The target of the Dollar is mentioned in the chart above. The dollar - rupee looks headed towards the 70 levels in the coming years. While the current market scenario is bearish, one can make only make money being stock specific and sector specific and betting against the trend could lead to losing big money. In the NBFC space I would stick to HDFC, Mahindra and Mahindra Financial services while would prefer HDFC Bank in the Banking Space.